My Galaxy S6 has a robust battery. It’s a great phone! And like all Samsung phones, it offers features beyond the stock Android set. One of them that I used recently was the Ultra Power Saving Mode. It worked amazingly well. 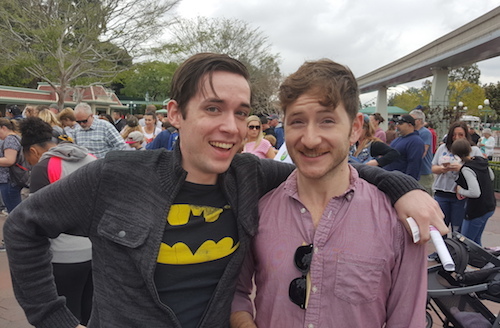 This past week, I went on a trip with two of my sons to Disneyland. I used the phone as a camera and took lots of photos, such as the one in Figure 1. Figure 1. My sons Jonah and Jordan in front of the Disneyland theme park. As often happens when you’re away from your primary locations, the phone tendeds to burn through battery power. Yes, I checked my mail and uploaded a few images to Facebook. That’s what phones are for, but the effect is that your battery drains. By the time we were waiting in line for the last ride, my phone showed only 36% charge left. That’s still pretty good, but as anyone who’s used a modern phone knows, just because I have a third of a charge left doesn’t mean I get an equivalent number of hours. Seeing that I didn’t really need the phone for photos or to check mail, I activated Samsung’s Ultra Power Saving Mode: In the Settings app, tap Battery, then tap Ultra Power Saving Mode. The phone’s touchscreen went to grayscale and showed only six icons. Mobile data was disabled. Wi-Fi and Bluetooth were disabled. I could send and receive calls, but that was about it. A phone call came in while the phone was in Ultra Power Saving Mode and I took it, which was great. And I could make a call, but the battery wasn’t draining. In fact, when I finally charged the phone, it still showed 36% power remaining — which I found most impressive! The Galaxy 6 also features a less-rigorous Power Saving Mode. In that mode, screen brightness is turned down, vibration is turned off, and some wireless features are disabled. These are the same battery-saving techniques I recommend in my Android For Dummies books. I could have just used that feature, but I really wanted to check out the Ultra Power Saving Mode. I’m glad I did. I must admit to only having an S3 and not really seeing a reason to upgrade (I can get my e-mails, surf the web, make phone calls, recieve the odd call!, battery life is not too bad if I disconnect the WiFi if I am not able to connect to the WiFi). the ultra power save mode might make me upgrade! It’s pretty sweet. I think I over did it, however. The battery life on the S6 is tremendous. It’s the best of any phone I’ve owned.